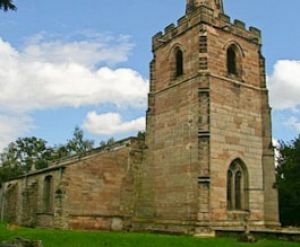 A 14th-century church with 15th-century alterations, St Michael's consists of a nave, chancel, north and south aisles, and west tower with a slender spire that can be seen for miles around. The whole structure is built of local sandstone, which has a very nice warm tone. The church stands near earthwork remains of a long-abandoned settlement. The interior is a mix of medieval and Georgian styles, with traditional 18th-century box pews. The very nice roof is medieval and features carved roof bosses and grotesque figures. The chancel arch is worth noting; it is not stone, it is built of wood with stucco over to make it look like stone, and is hollow inside. Another medieval feature is a nicely carved alabaster grave slab in the north doorway, commemorating Richard Savage (d. 1489) and his wife Agnes. On the floor nearby is a slab which is possibly that of their son Walter (d. 1518). At the east end is a very worn medieval tomb, perhaps that of the founder of the church. The slender font is a very nice 17th-century example, built around 1660. The floor is made of attractive multi-coloured tiles, which really add to the atmosphere of the interior. St Michael's is no longer in regular use and is under the care of the Churches Conservation Trust.